SAN FRANCISCO, CA / ACCESSWIRE / February 23, 2017 / Akbar Sheikh, Co-Founder of Layla Sleep, a memory foam mattress company, is pleased to announce a new partnership with a homeless shelter in San Francisco, CA. When someone purchases a mattress from Layla Sleep, the company will give someone in need the opportunity to sleep on a bed that night at Episcopal Community Services. To learn more about the generous partnership between Layla Sleep and Episcopal Community Services, please check out the YouTube video at https://www.youtube.com/watch?v=3BL0GGzEPs4. "It is a very simple concept," Sheikh said. "Every time someone buys a mattress from us, they get to sleep on it that night. This new partnership lets us help someone less fortunate than us and make sure that a homeless person will sleep on a mattress as well." Bruce Burry, Director of Development at Episcopal Community Services, said the partnership with Layla Sleep will have a direct and positive effect on the shelter's guests. "The kind of funding that will come from Layla will allow us to continue to treat the residents of our shelters with the kind of respect we think they should be receiving," Burry said. The partnership with Episcopal Community Services is not the only exciting news to come out of Layla Sleep; in addition to giving back to the community, the company has also announced the official opening of their Amazon.com listing. Now, in addition to purchasing a copper-infused memory foam mattress in Full, Queen, King and other sizes online at LaylaSleep.com, people may now buy the mattress on Amazon. To learn about the many features that are found in the Ultimate Copper Infused Layla Mattresses, read memory foam mattress reviews and see why many people have called Layla the best memory foam mattress money can buy, visit the new Amazon listing at https://www.amazon.com/Memory-Foam-Mattress-Technology-Inflammation/dp/B01FKRQ91G. "Copper keeps the mattress cool, it can help reduce joint inflammation and it may help ease joint pain and stiffness," noted a company spokesperson, adding that copper may also contribute to better blood circulation. "Layla also offers a lifetime warranty and each memory foam mattress in King, Queen and other sizes are manufactured 100 percent in the USA with high quality foam and fabric so we have no problem slapping a lifetime warranty on your Layla." 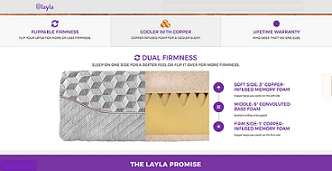 Layla is the first mattress to infuse copper with memory foam so people can sleep like a Pharaoh. Layla is the only mattress with two different firmness levels built in; sleep on one side for a softer feel or flip it over for more firmness. For more information, please visit https://www.amazon.com/Memory-Foam-Mattress-Technology-Inflammation/dp/B01FKRQ91G.